Please enter the Exploratorium through the Historic Pier 15 Bulkhead located directly on the Embarcadero. The Kanbar Forum is located to your right immediately upon entry. There will be no Museum access included as part of this screening. Canyon Cinema is pleased to welcome filmmaker, curator, and teacher Janis Crystal Lipzin to the Exploratorium’s Kanbar Forum for our first Salon of 2019. A longtime professor of Film and Interdisciplinary Studies at the San Francisco Art Institute, and one of the creators of Eye Music, a pioneering itinerant microcinema that in the 1970s and 1980s showed experimental work in venues across the Bay Area—including the Exploratorium itself—Lipzin has been situated at the center of regional and national avant-garde film cultures for over thirty years. 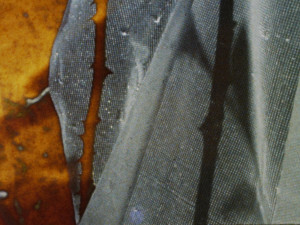 Her recent work combines analog and digital filmmaking techniques as a means of formal, anthropological and photochemical inquiry. Tonight, Lipzin presents the two parts of De Luce, a study of the unpredictable relationship between light and celluloid, as well as the sly amusement park ethnography Micro-Celluloid Incidents in 4 Santas. Las Manos, the most recent iteration of Lipzin’s long running Visible Inventory series, also has its San Francisco premiere. These are shown alongside stylistic and thematic antecedents made by women in Canyon’s catalog, including Joyce Wieland’s Solidarity, a sympathetic portrait of striking Canadian workers that never shows a single face; Gunvor Nelson’s Field Study #2, a live-action/animation collage hybrid film; and Marie Menken’s Notebook, which collects short, radiant sketches and ideas produced by the filmmaker over a twenty year period. Also on display is Lipzin’s video installation Luminous Greenhouse, and a series of artist’s books she has produced over the last year. To see an excerpt from Micro-Celluloid Incidents in 4 Santas, click here. To see an excerpt from De Luce 2: Architectura, click here. A woman's response to technology/the jet-lag of birth.